Data Mining is an analytical process to explore data looking for patterns. 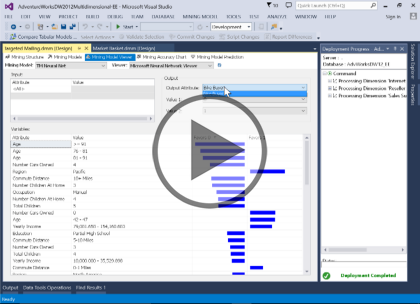 In this course, you will learn how to create a model from a data source and by using data sets and SQL Server Data Tools analyze data. By using business questions like "what customers may be inclined to buy a product" or "how products are grouped" to looking for patterns of fraud, business analytics are a powerful tool to both examine data and look for predictions. Finally, when Data Mining should be used vs a Lift chart will explained giving you power choices in getting control of your data. This course assumes that students have working experience with SQL Server; basic relational database concepts (e.g., tables, queries, and indexing); data transformation services.